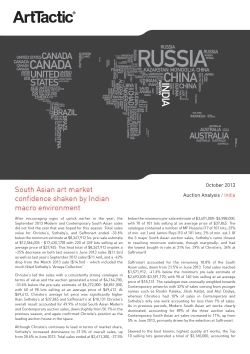 South Asian art market confidence shaken by Indian macro environment. After encouraging signs of uptick earlier in the year, the September 2013 Modern and Contemporary South Asian sales did not find the zest that was hoped for this season. Total sales value for Christie’s, Sotheby’s, and Saffronart ended -33.6% below the minimum estimate at $8,347,912 (vs. pre-sale estimate of $12,566,035 – $17,430,170) with 220 of 339 lots selling at an average price of $37,945. This final total of $8,347,912 implies a ~25% decrease on both last season’s June 2013 sales ($11.3m) as well as last year’s September 2012 sales ($11.4m), and a -42% drop from the March 2013 sale ($14.5m) – which included the much fêted Sotheby’s “Amaya Collection”. Christie’s led the sales with a consistently strong catalogue in terms of value and the auction generated a total of $4,164,700, -33.6% below the pre-sale estimate of $6,272,000- $8,851,000, with 60 of 98 lots selling at an average price of $69,412. At $69,412, Christie’s average lot price was significantly higher than Sotheby’s at $37,845 and Saffronart’s at $18,131.Christie’s overall result accounted for 49.9% of total South Asian Modern and Contemporary auction sales, down slightly from 50.1% in the previous season, and again confirmed Christie’s position as the leading auction house in the space.